Renowned for their explorations of musical expression and leading research in science and acoustics, the Paris-based IRCAM institute now offers up a second Pack for Live users. Eight audio effects, two instruments and one MIDI effect make up a collection of unique and powerful tools for advanced audio processing, expert sound design and creative experimentation – all within accessible Max devices. Here’s a rundown of the Pack’s instruments and effects. IM-PsychHarmonizer: Vocal harmonizer allowing separation and manipulation of monophonic vocal sounds. IM-Freezer: Freezing effect that lets you create sound textures by freezing, scrolling and stretching live or pre-recorded sounds. IM-Ianalyzer: A real time polyphonic Audio to MIDI converter that lets you manipulate and resynthesise a signal’s psychoacoustic properties – and capture and reuse the resulting data as MIDI. IM-NoteTracker: A Real time Audio to MIDI converter that extracts a signal's estimated pitch and amplitude and converts them to MIDI note components. IM-Chromax: A spectral delay that converts chords into harmonics models, whose set of consisting frequencies can be further transformed, and used to define delay, feedback and filter shapes. IM-ModalysFilter: Uses the revered IRCAM Modalys engine to filter the signal with physical modelling processes. IM-GrainDelay: A grain delay effect that can be synchronized to Live’s tempo and used with the IRCAMAX MIDI Send/Receive device to receive MIDI notes that control transpositions of the grains. IM-MultiFX: Four effects in one – delay, reverb, chorus and auto pan – that can be used as a simple FX box tool for all your synths. 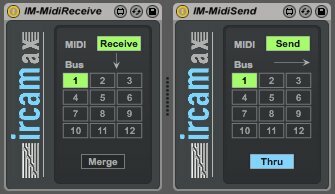 IM-Midi Send/Receive: Whether coming from a MIDI clip or the result of audio analysis of an audio track, these devices let you send and receive MIDI data between any IRCAMAX device within a Live Set. IM-ModalysSynth: A polyphonic synthesizer based on IRCAMs flagship Modalys physical modeling engine – technology with over 20 years of research and refinement. IM-MatrixSynth: A 3-oscillator, 3-envelope polyphonic synthesizer with a multimode filter and flexible modulation matrix. The IRCAMAX 2 devices were developed by Jean Lochard at IRCAM and Manuel Poletti at Music Unit.